Steve Farmer accuses Asko Parpola, I. Mahadevan and “The Hindu” too! Asko Parpola”s talk at Chennai and outburst of Steve from Harvard: In www.Indiainteracts.com, I posted the proceedings of the Asko Parpolaa talk delivered on 17-02-2008 at Roja uthaiah Hall, Taramani, under the caption, “The Row over Indus Script: Why Asko Parpola”s paper questioning Michael Witzel was not published?” considering the importance of the issue. The organizers had evidently discouraged the questions. I already pointed out as how K. V. Ramakrishna Rao who started asking Asko Parpola as to why his paper was not published in the Stanford University proceedings, and proceeded to ask about the IVC symbols appearing in Soghura Copper plate, punch mark coins, why the animal symbols were chosen to be used etc., he was prevented on the plea of shortage of time. The press has also not covered it properly as each paper carried the story differently. Either the reporters did not care to get the names of the persons who discussed with Asko Parpola or the organizers would have given different Press Note. 2. Parpola”s talk was given in the Roja Muthiah Research Library, which houses what is gloriously called the “Indus Valley Research Centre”, apparently a small one-room office in the Library, which was founded by Mahadevan and his Tamil nationalist friends to counter the influence of our 2004 paper, which for obvious reasons is as anathema to Tamil nationalists as it is to Hindutva nationalists. The long stream of stories in The Hindu since we published our paper have all revolved around this “Centre” and the Library. > like the Archaic Sumerian script. Odd comment, since stamps and seal impressions from Sumer certainly don”t contain any “writing.” Seals and seal impressions go back thousands of years before writing, incidentally, and were used world- wide by literate and illiterate societies both. (cf. also the more detailed arguments in our paper)Asko has carefully ignored this issue everytime we”ve spoken together — at Harvard 2002, in Kyoto in 2005, and at Stanford 2007 — but he brings up the “lost manuscript” thesis when speaking with reporters, since there is no one there to challenge him on it. > survived or had not been recognised. last remnants of Indus civilization were gone (cf. Marshall 1951). The supposed “analysis of painted texts on Harappan pots and bangles” that Parpola speaks of refers to a line in the 1929 doctoral thesis of G.H. Hunter, who invented the “lost manuscript thesis.” I discussed this issue again at length at Stanford, in Parpola”s presence, and he didn”t say a word. Things change when there is no one to respond to him. I have added emphasis to drive the points for discussion to know how the Western Indologists have been acting and reacting about and against India. Steve”s criticism of “The Hindu”: For Steve Farmer and Michael Witzel, “the Hindu” or “Frontline” has not been anything new, as they were reigning supreme in getting their articles published in the “Open pages” of it and in Frontline. I have given the following as illustrative purpose and it is not exhaustive. Horseplay in Harappa Micheal Witzel and Steve Farmer Frontline October 13, 2000. So what happened in between? Why all of sudden he should point to “the Hindu” differently? N Ever since we (Steve Farmer, Richard Sproat and Michael Witzel) published “Collapse of the Indus Script Thesis” in December, 2004, the Hindu has posted an endless series of stories like this, most involving Iravatham Mahadevan. So “The Hindu” did not like your Company after 2004? He is so worried to note the love of “the Hindu” has shifted from their Company to I. Mahadevan! When they were publishing articles of your Company, which friend was there close to the owners of “The Hindu” is not known. Anyway, the role of “The Hindu” manipulating in Indology, history and related topics have been exposed. N The stories included the announcement of Mahadevan”s claimed Tamil-Nadu “Indus axehead”, which supposedly carries an Indus sign that Mahadevan identifies with the Tamil god Murukan, who isn”t attested historically until thousands of years after the Indus civilization was gone. The Steve and co. doubt the reading of I. Mahadevan! Iravatham has to be careful with Steve, because, earlier Steve accused R. Madivanan involved in an IVC forgery and he has also explained in detail in his article published in Steve ” Co electronic Journal. Refer to my earlier posting for details. Mahadevan”s identification of Murugan”s name with the symbols found on doubtful “Indus axehead” is unhistorical. The claim is made after the disappearance of the IVC. N (No serious Indus researcher besides Mahadevan accepts the legitimacy of the “Indus axehead” found in Tamil Nadu. He not only throws doubt on the so-called “Indus axehead” finding. But also questions the status of Mahadevan. Only Steve has to differentiate between the so-called “serious Indus researcher” and “not serious Indus researcher”. Dorian Q. Fuller has already recorded his “skepticism” of the finding. Nicole Boivin has also concurred with Dorian Q. Fuller. N The long stream of stories in The Hindu since we published our paper have all revolved around this “Centre” and the Library. “The Hindu” has so much interest around the “Centre” found by I. Mahadevan! So Steve is not happy with “The Hindu”. “The same Hindu” that promoted Steve gives pain to Steve – Why? Perhaps, now Asko Parpola gets support from it and his articles might be published soon. Of course, Asko Parpola himself has accepted that his paper would be published by I. Mahadevan, when, K. V. Ramakrishna Rao asked him on 17-02-2008 during the discussion. N It”s interesting that he says this to reporters. The reporters obviously including “The Hindu” that carried the story next day. Perhaps, he questions the reporters as to whether they know the nuances of scripts written on perishable and non-perishable materials. N Thus scholarship on the “Indus script”: guerilla warfare in newspapers which under no conditions will publish rebuttals. “The Hindu” under no conditions will publish rebuttals, implying that Steve ” Co., might have sent their articles to “The Hindu”., but they are not published! Of course, the fact has to be verified. Anyway, as otherwise, Steve would not have been so angry with “The Hindu” as the Hindutwa people have been also angry with “The Hindu”! Steve tirade against Iravathan Mahadevan: Interestingly, the tirade against Iravatham Mahadevan, one of the leading “native” Indologists is interesting and intriguing, as hitherto, he was supporting only Steve and Co.
N By accusing that he, “is a close friend of the owners of the paper“, what he tries to imply is not known. Perhaps, he tells that “The Hindu” has been now biased against him supporting I. M. and A.P. N It is really unbecoming to dub him as a not “serious Indus researcher”. N He questions the legitimacy of the acceptance of symbols found on the doubtful “Indus axehead”. N Steve perhaps doubts Mahadevan has been behind for their “rebuttals” not published. N He strongly criticizes the “Research Centre” founded: “….the Roja Muthiah Research Library, which houses what is gloriously called the “Indus Valley Research Centre”, apparently a small one-room office in the Library, which was founded by Mahadevan and his Tamil nationalist friends to counter the influence of our 2004 paper, which for obvious reasons is as anathema to Tamil nationalists as it is to Hindutva nationalists. The research centre is apparently a small one-room office in the Library, so what? Is there there any condition that research cannot conducted sincerely, seriously and with standards in one room? It is evident that Steve has become desperate in accusing others. Steve accuses that the research centre, “…..was founded by Mahadevan and his Tamil nationalist friends to counter the influence of our 2004 paper, which for obvious reasons is as anathema to Tamil nationalists as it is to Hindutva nationalists.” but what about his background? He has been accused of as a Christian fundamentalist by his friends and others in Internet forums, that too, based on his Ph.D thesis? Would he disprove that? The rationale being, “….. for obvious reasons is as anathema to Tamil nationalists as it is to Hindutva nationalists.” Why their 2004 paper has been anathema to Tamil nationalists? Why all of sudden “Tamil nationlists” have come here? Why they should oppose Steve and Co? Why even it is anathema to Hindutva nationalists? When he has liberty of arrogance to dub others as so, what brand of “ideology”, he is belonged? He must have some anti-ideology against “Tamil nationalists” and “Hindutva nationalists“. That means, he agrees that he has beemn an anti-Tamil and anti-Hindu ideologist? Steve should come out openly, before he alleges and accuses others, that too from Harvard University. N The average inscription” using Mahadevan”s concordance, which lists 2,905 objects, is 4.6 signs long. That concordance (not a good one) was published in the 1970s. So what, how he can discredit another scholar like this without any decency and decorum? Is it not unbecoming for a person claiming as “serious Indus researcher” that too hailing from Harvard? Who is he to declare that, “That concordance (not a good one) was published in the 1970s. Is it worthwhile to say so? So his complete tirade against Iravatham Mahadevan is exposed here, as he has stopped down to such a mean level to discredit a monumental work on IVC. In fact, the International scholars should condemn him for his arrogance, pride and foolishness of his outbursts made in Internet forums in which he claims there have been world-famous, first class academicians, historians and scholars are there. Steve should come out openly what Asko Parpola ignored about their speech. Or Asko should clarify, as this is a serious issue for Indians and others also. The scholars cannot go on play with our historical issues, controversialize it and make Indian progeny to read false histories as has been going on. They have every right to know the background of how Indian history was written, has been written and is written. ” but he brings up the “lost manuscript” thesis when speaking with reporters, since there is no one there to challenge him on it. “This one is really a stretch, picking up a passing line in Hunter 1929 that no one has ever taken seriously. The reason Parpola now resurrects this argument (without showing any visual evidence for it, since there isn”t any)”……….. that no traces of writing instruments or writing paraphernalia show up in Indus iconography or among Indus artifacts (see “Collapse” above, pp. 24-6, in the section entitled “The Lost Manuscript Thesis”). Expected markers of manuscript production involve things like inkpots (also ink residues), brushes, palettes, styli, pens, other literate paraphernalia; pictures of scribes, texts, and writing instruments in art; signs in inscriptions (when symbols as in the Indus case are partly pictographic) of scribes, texts, writing instruments, etc. Not one trace of anything like this is found in the Indus Valley (for detailed discussion, see the above pages). Interestingly, Marshall (who oversaw the early Indus excavations, and accepted without discussion Hunter”s “lost manuscript” thesis, since it allowed him to accept the claim that the Indus peoples were literate, like the Mesopotamians or Egyptians), found abundant evidence of writing materials in his excavations in Taxila, in Indus territory but of course from a period over a millennium after the last remnants of Indus civilization were gone (cf. Marshall 1951). The supposed “analysis of painted texts on Harappan pots and bangles” that Parpola speaks of refers to a line in the 1929 doctoral thesis of G.H. Hunter, who invented the “lost manuscript thesis.” I discussed this issue again at length at Stanford, in Parpola”s presence, and he didn”t say a word. Things change when there is no one to respond to him. So if evidences were / are there what happened to them? Why one scholar should say the material evidence are available and another deny? I have already pointed out the foul play played by John Marshall suppressing the manuscripts of R. D. Banerjee and even making photographs disappearing. Therefore, how Indians have to rely upon in this context? Who is telling truth and who is lying? ” (On this issue: at Stanford in our conference, Michael presented detailed evidence undercutting the idea that the Indus Valley was Dravidian speaking. So that undercutting has made the “Tamil nationalists” unhappy as “hindutva nationalists”. ” Again, Parpola didn”t say a word, and in his own talk in our day-long conference didn”t even use the word “Dravidian” once, since Michael, Richard, and I were all there. So Asko was supporting your undercutting “Dravidian theory”, as long as you were there. So Asko took one week to get him prepared to oppose you with pro-Dravidian or “Dravidian theory”. Anyway, it is ironical, that “the Three” were not present! But what about their “rebuttals” against him? At least, they could have published in other non-guerilla warfare journals! Warning to Indians, particularly to the youth and Children: Now, we know India youth and children have been reasonably intelligent knowing the facts with hard work. Perhaps, they have to compete with crores of other colleagues in their competition. So they have to know the way in which our “Indian history” was written by the British and western scholars and has been written by our Indian historians and others faithfully following their methodology. So they should read the history with the background of their scientific thinking and critical analysis of facts of development of Numbers, number system, script, philiosphy and psychology behind it etc., as they expose the truth behind the Indian civilization, which has been target of all by all means. No doubt, not only the Steve-Witzel type arrogant category, “The Hindu” type Communists, or Dravidian ideologists may immediately jump and dub it as “Hindutva” and so on. But the youth and children should pursue and find out the facts. B We do not know how Jon Marshall and R. D. Banerjee fought with each other when his findings were not published. B We do not know as to how Thomas Watters warned Vincent Smith not to edit his manuscript. B We do not know how Buhler disappeared or died mysteriously falling into waters reportedly “in a boat accident”, as he opposed Vincent Smith and other for their manipulations. B We do not know how Dr. Alois Anton Fuhrer, Editor of Epigraphica Indica was dismissed from the service in 1898 for his forgery of creating Buddhist Urns and with Asokan inscription on them. B We do not know how so many Indian manuscripts were taken away to foreign countries but not available to Indian researchers to be accused of as not “serious”. B We do not know how Witzel and Co., have reportedly acquired manuscripts from India. B We do not know how and why Dr. (Vincent John Adams) Flynn could go oin smuggling valuable historical evidences of Indian history dating from c.1000 BCE from India till he was arrested at New Delhi Airport? He has been a very close and good friend of AAA Rizvi, Nural Hassan, Irfan Habib and other “eminent” and “elite” historians of India! I stop, because the list would increase as K. V. Ramakrishna Rao gives hundeds of such instances. In any case, We have a right tp provide them the factual position. Of course, Indians have every right to write their history and rewrite also if anything is wrong, manipulated, falsified, fraudulently written etc., as there have been instances. The western or non-Indian or even Indian ideological Historians cannot accuse such historians as “nationalist”, “Hindutva” and so on, as they could not set right the things for the last 60 years. In fact, they have only enjoyed crores of Indian tax payers amount but misleading Indians. Therefore, it rigt time for every true Indian to probe into the incidences of Indologists, historians and scholars fighting with each other and expose the motive behind it. There have been hundreds of papers published in the JRAS, JOBR, JBORI, etc. Even though, the organizers took the name, signature, e-mail and phone number, they refused to give the details of the participants in the discussion. When Vedaprakash questioned the Asko Parpola”s interpretation of “Dravidian megalithic people” invading India and coming to South India, he persisted that Asko never wrote like that. See Asko Parpola, Deciphering the Indus Script, Cambridge University Press, 2000, pp.171-175. Accessible to the members of the yahoogroup. This symbol is used by Steve and his friends connoting some other meaning, which is not revealed to others. Note his sarcasm and scorn at his colleague. I do not understand it or its meaning. I would be grateful, if it is clarified. It looks like Indian politician”s claim of eradication of poverty, or giving job to all, education to all etc., which are not possible. As he has decided that it is not a script related to any languages, he would stick to his stand only. When he knows that I.M is close to the relatives of the owner of “The Hindu”, the Indus Research Centre has been in a single room etc., why he says that it is “reported”? Definitely, his Indian contacts would have sent details and photographs also. Asko says Steve and Company ha been adamant to their view point by asking irrelevant questions and they resused to publish his paper also. How Indians could believe such claims when so many Indian artifacts are smuggled out of IVC even today. Can the non-availability of evidence can negate the fact? Even Steve”s papers are only hypothesis and theory. How can he impose his hypothesis or theory as final on others? There was a discussion, but of course, there have been interests working at different angles in India and it could not be pursued effectively. I, II suggest that there have been other articles. I could not locate immediately from the paper cuttings. Of course, there have been articles of Patricia Norelli-Bachelet, Dravid Frawley, but Wizel was bombarding them. In fact, The Hindu published his article every week, whereas, the so-called rejoinders appeared much later that too in edited form, only in the case of Dr. R. Nagaswamy. Refer to my earlier article. Abstract volume of the International Symposium on Indus Civilization and Tamil Language, held at Chennai on February 15th ” 16th 2007, pp.23-28. Ironically, not only the invited International scholars attended the conference, but even I. Mahadevan did not turn up. Generally, the reporters have been so intelligent in questioning the Politicians and other ideological historians, but why they are not questioning the foreign scholars similarly. Are they afraid or they have some sort mind-set, that they should cause foreigners inconvenient? Perhaps, he has been so anxious or fond of Hindutva nationalists! So there has been an ideological war started. Why then Steve dubs it as a guerilla warfare and so on? Of course, he never responds as vigorous as he has been now, as he is perhaps afraid of getting exposed. In fact, he is accused of posting pro-Christian and anti-Hindu postings in Wikipedia by a trained group comprising ITwalas. Government of India Proceedings (Part B), Department of Revenue ” Agriculture (Archaeology ” Epigraphy Section), August 1898, File No. 24 of 1898, Proceedings Nos. 7-10 (National Achieves of India, New Delhi). P. C. Mukheji, Report on a Tour of Exploration of the Antiquities in the Tarai, Nepal, JRAS, 1898. This entry was posted on July 16, 2009 at 9:32 am and is filed under Uncategorized. You can follow any responses to this entry through the RSS 2.0 feed. You can leave a response, or trackback from your own site. Considering the relevancy, it is re-posted here. Really, the involved historians or Indologists should come out and clarify their position. It is ironical to note the role of “The Hindu” in these issues where historians / Indologists are involved. As for as we, Indians are concerned, it is a serious issue and therefore, we have to know the facts. As I came to know that http://www.indiainteracts.com has temporarily suspended bogging, I post related articles under connected earlier blogs. Recently Prof Michael Witzel has been in Chennai delivering his “conferences”. Therefore IO post here. 4 and 5 are nothing but my postings about the first and second conferences of Michael Witzel. Perhaps, you must have met Michael Witzel at Bangalore. If so, kindly provide your interesting experience with him. If you permit and provide full papers, I shall post here with comments. I have exchanged correspondences with him. You can post the full papers and elicit comments. No problem. I tried with the links provided, the first is not working and the second gives only the summary of “Syncretism and Acculturation in Ancient India: A New Nine Phase Acculturation Model Explaining the Process of Transfer of Power from the Harappans to the Indo-Aryans – Part Two” and therefore, if you could mail to me or mention the site, I shall post them with due acknowledgment. Of course, if you are willing, you can provide the correspondence you had with Michael witzel. what about frawley’s parodox? how z that so much ‘intelligent’ vedic people who can remember hundreds of verses through memory did not had script? and how z that so much perfect so called indus people who can have even a drainage system did not leave any litrary evidence? i still feel for this no satisfactory answer has been provided by either group. can any body clarify? Everyone has been wrong with the exception of Iravatham Mahadevan, who actually got correct phonetic values for a few of the signs, while at the same time wrongly claiming the underlying language was Dravidian. Above link is not working Sue Sullivan. PLEASE SEND ME E MAIL FOR $10,000 Prize Announced by Farmer, Sproat, and Witzel. I AM QUITE SURE I HAVE DECIPHERED THE STONE WRITING. SO THAT FURTHER RESEARCH CAN SETTLE FINER THINGS. You may comtact them at the Indo-Eurasian Research discussion group, but I’m quite sure you will not get any money out of them. They require that your work be assessed by prominent Indus script scholars and accepted by them, before any payout is possible. I have an Indus Valley copper tablet with 31 characters – it looks genuine. Do you have a link to a photo of it? I’d love to see it. It is evident that you have asked Mr S. M. Sullivan. If he has, he can provide. (f)	It is one of the most famous of Harappan inscriptions. (g)	It was very large in size. (h)	It was located in Far from Mesopotamia Dholavira and in one of the furthest sites from Mesopotamia. (i)	It hung over the citadel there. (j)	It must have represented the name of the place and must have been closely tied to speech: note the sign repetition. 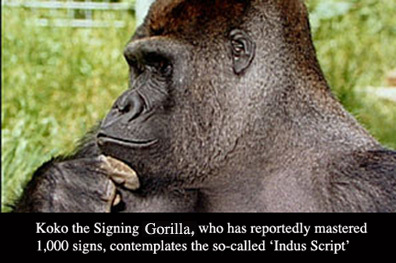 (k)	The sign which was used as a determinative was a very common Indus sign. (l)	The sign used as a determinative appears to have been also similar to determinatives in other writing systems. (m)	The Indus script was also related to Proto-Elamite which means it probably had a linguistic component. (n)	The other signs with which the determinative was used were also common Indus signs. (o)	Few sensible scholars will now dispute the fact that the Indus script was a logo-syllabic script on the basis of this evidence. (p)	Few sensible scholars will deny the fact that speech encoding was one of the major functions of the Indus script and had this feature had reached a very precocious maturity. (q)	This inscription was apparently more closely tied to speech than most proto-Elamite inscriptions. (r)	Dholavira was not even the most important of sites. (s)	The fact that it was hung over the citadel meant it was meant to be read by elites. (t)	It was put to the most frivolous use. (u)	Speech encoding would have been a prized possession: no one would have used it just for a decorative signboard at far-from-Mesopotamia Dholavira. Why would a man who had inscribed this, done so (a) if nobody else could read it (b) why would he have learnt to encode speech only to inscribe this signboard? This automatically implies the existence of longer texts. It also shows that the Indus elites used more complex forms of communication. (v)	Even if we assume that speech-encoding was added in Mature Harappan 3B, this logic would still hold good. Thank you for your responsive comments. We are to face them, when they come again. Kindly inform us, if they come to India. Sometimes, we may miss them, as they do not publicize, reveal or declare their visit with guts! Thank you for your response, but, I have never posted anything in Youtube.